• White River fruit was not damaged by Thursday night’s frost. • A girl baby was born to Elmer and Mrs. Clinard Sunday. • Word was received in Meeker this week that Miss Hazel Cotton and Mr. Charles Frost were married April 1 in Denver. • Latest reports are that Orville Hicken, Jewell and George Butler, Glen, Harold, Charlotte, Betty, Warren, Loren and Lawrence Govreau all have the measles. • We are having unsettled weather in this locality. The storms have been accompanied by raw winds. • Meeker taxpayers will vote on Walbridge Nursing Home proposal next Tuesday. • Mr. and Mrs. Marion Richardson announced the engagement of their daughter, Miss Ilene Richardson, to Mr. Tom George, of Meeker, Colorado. • Mr. and Mrs. H.H. Dunham of Little Beaver announce the coming marriage of their daughter, Miss Joan Dunham, to Melvin Barley, son of Mr. and Mrs. Vergle Barley of Clifton. 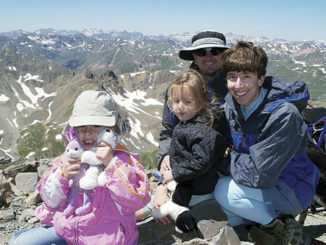 • The Meeker School Board adopted a plan to implement a four-day school week. • Dale Hallebach met long-time friends at the Canyonlands Needle District in Utah last week. • Winners of the annual Easter Basket Contest: Jamie Chintala, Chad Boren, Bobbi Jo Watt, Elisha Watt, Lindsey Cook, Amanda Dare, Sheila Dare, Jena Hoke, Chrissy Ellis, Rhonda Gilbert, Molly Bivens and Abby Rael. • Motor scooter operators were warned today not to exceed the speed limit or operate the vehicles without mufflers within city limits. • Our national debt has increased approximately 13-fold since abandonment of the gold standard in March 1933 — from $21.4 billion to over $291.5 billion. In the same interval the population has risen by only 42.4 percent. • Miss Rose Steele, 16, has been selected to be a state finalist in the 1980 Miss United Teenager Pageant. • Rangely’s newest town officials took office Tuesday, April 8. • Dr. Robert Mullen was named the new superintendent of the Rangely School District. • 420 dozen Easter eggs were located during the annual Easter egg hunt. • One-car accident injures 11. RANGELY I Different year. Different team. Same result. 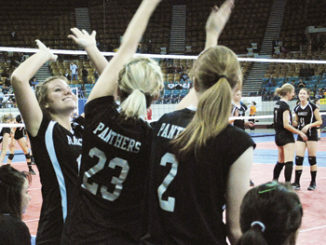 The Lady Panthers lost all three matches at the Class 2A state volleyball tournament last weekend in Denver. Two years ago, the same thing happened.